An 18-month-old baby survived a car crash and spent 14 hours strapped upside down to her seat after the vehicle hurtled into a near-freezing river. Infant Lily Groesbeck was found by fishermen hanging upside down in the car, with the river’s waters never reaching high enough to touch her, Police Lieutenant Matt Johnson told a local newspaper. 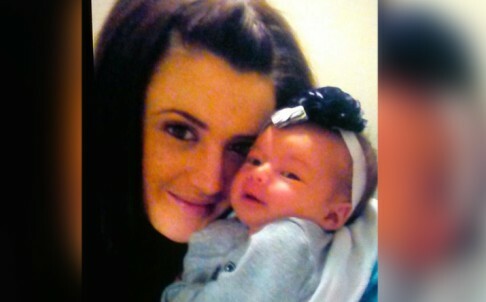 Her mother, 25-year-old Lynn Groesbeck, was found dead in the driver’s seat. The mother and baby were on their way home to Springville city, in the US state of Utah, when the car struck a cement barrier on a bridge and careened into the Spanish Fork River. The temperature dipped to about 0 to 3 degrees Celsius overnight while the baby was trapped in the car. Police investigators believe the accident happened at around 10.30pm on Friday, as a resident near the accident site reported hearing an unusual sound. But the resident could not find anything out of the ordinary when checking the area. Lynn Groesbeck’s family said she had just been to her parents’ home in Salem that night, before heading home. Fishermen discovered the upturned car at around 12.30pm the next day, Johnson said, with the baby still alive. Baby Lily was in stable but critical condition at a Salt Lake City hospital. “She is doing remarkably well considering the circumstance. The doctors have been hopeful so far,” the mother’s sister, Jill Sanderson, told a TV news station. “We would like to express our appreciation to the Spanish Fork rescue team for saving the baby’s life,” she said. Lynn Groesbeck was enrolled at Provo College with a goal of becoming a medical assistant, Sanderson said, and had lived in the Provo area her entire life. Three police officers and four firefighters who entered the river for the rescue were released after treatment for hypothermia at a hospital. They had to push the car on its side to rescue the baby and retrieve the mother’s body. Police are unsure why the car crashed. The Utah Highway Patrol is assisting in the accident investigation. Baby Lily was saved by an Angel. The Angel gave the rescuers the human strength to push the car to its side, and kept the rescuers safe. And the spirit of her mother hung around to comfort the baby until help came. From Robert’s conversations and channeling Angel Brenda – about Baby Lily and mother. Robert have been receiving constant afterlife signs from the moment Brenda crossed over on 23 December 2013. See Robert and Brenda’s Twin Soul Infinite Connection in Twin Souls Parts 0-46 (46 parts as of 10 March, 2015. This will be the basis of a book about afterlife signs and the Spirit World).